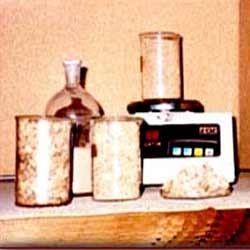 We are a reliable firm engaged in offering Cork Powder to our clients. Our product range also comprises of Rubberized Cork Products, Cork Products and Anti Vibration Pads. These cork products are highly demanded in the market. We offer these products at highly reasonable rates. We have carved the niche in the industry by providing a qualitative range of Cork Powder to our respected clients. Prepared by making use of excellent mesh, offered product is in tune with the set industry standards and norms. Furthermore, these products are used in Molding, Founding, Battery industry and Linoleum industry. Looking for Cork Powder ?